David Wattenbarger built this firm to be small and focused on providing the best possible service to a select group of financial planning and investment management clients. This remains our priority as we grow -- we believe that the best outcomes come from working with clients who are a good "fit" for our process and approach. Are you looking for focused, tailored advice? David and DRW Financial offer comprehensive financial planning and sophisticated investment management, both on a fee-only basis. David is a CFP®, a Chartered Advisor in Philanthropy®, and is pledged to deliver advice as a fiduciary. DRW Financial believes in working closely with our clients to allow their values to inform and align their financial plans and investments. In two recent blog posts we explored what "financial planning" and "investment management" can offer. 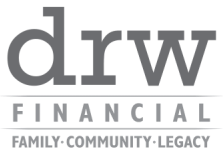 ​If you would like to learn more about whether DRW Financial is a "good fit" for meeting your planning or investment advice needs, please email David@DRWFinancial.com for a "no cost" consultation.